Americans seem to look forward to Super Bowl TV commercials as much as the Big Game itself. That’s why Fox 4 Good Day hosted CD Krista McCrimmon to review this year’s ads. 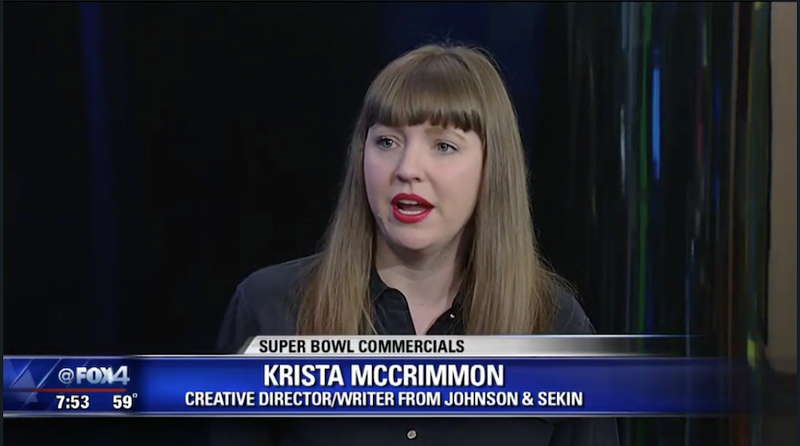 The five-minute segment reviewed the game’s best and worst spots from Krista’s expert branding and creative perspective. Her personable and smart delivery represented the agency, and the Dallas ad community, extremely well. The Super Bowl is consistently the most-watched program in the US, with well over 100 million Americans watching this year’s game. The price of spots has risen $1M annually since 2013, with this year’s spots costing a record $5.2M for a :30 spot, equating to $172,000 per second.